While the rest of the country is still fixated on cheap tequila shots—mostly likely blanco because they don’t know any better, those with a more refined palate are switching over to its less pedestrian cousin from the south. Originating from Oaxaca, smoky, earthy mezcal still has a fairly small market, so small that it’s only currently being exported to fewer than 30 countries. It isn’t, therefore, easily on hand in most bars in the United States. Yet those in the know in hip cities like New York and Austin don’t just sip it, swish it around in their mouths and then drink it neat; they also invent the most incredible cocktails with it. In the art of mezcal mixology, the city that perhaps takes the lead is Los Angeles where these days, the spots that matter are those with mezcal on their cocktails list. Here are five of them. Top mixologist and cocktail ambassador for Los Angeles Beau du Bois takes the helm at The Corner Door, Culver City’s friendly neighborhood bar. The cozy space, which has been given a fresh new look this year with vintage photographs, old-fashioned ceiling light fixtures and padded leather chairs, is a favorite local haunt not just for its ambiance but also for its excellent menu of quick bites and hearty plates. Most importantly, thanks in large part to du Bois’ genius, it’s also got some of the best mezcal cocktails west of Hollywood. Premium El Silencio mezcal takes center stage in his Mezcallin, a tart yet sweet concoction of lemon, ginger and pineapple gomme that proves to be a great gateway cocktail for non mezcal drinkers. It’s his award-winning Negroni variation, however, that hogs the spotlight. An ode to the best tacos in LA, the Taco Truck Mezcal Cocktail is strong and boozy, yes. But it’s also delicious with hints for pineapple and toasted cinnamon that enhances the smoky flavor of mezcal. It’s little surprise that it has been name dropped by many as one of the best cocktails in LA. Mix that baby up with an order of their homemade chicharrones, and you’re in business. Considered by many as LA’s mezcal paradise, dive-y cocktail den La Cuevita lives up to its name in design. It’s the place to hole up in with your friends, dark with nooks and crannies for a bit of privacy. It’s one of LA’s best Mexican bars, so expect Día de Los Muertos artwork and Mexican fiesta banners. The music, though, might not be what you’d expect (think Americana rock, new wave and punk). Its heart is still very Mexican, however, with its Taco Tuesdays (free tacos, anyone?) and its collection of Mexican spirits like tequila and mezcal. 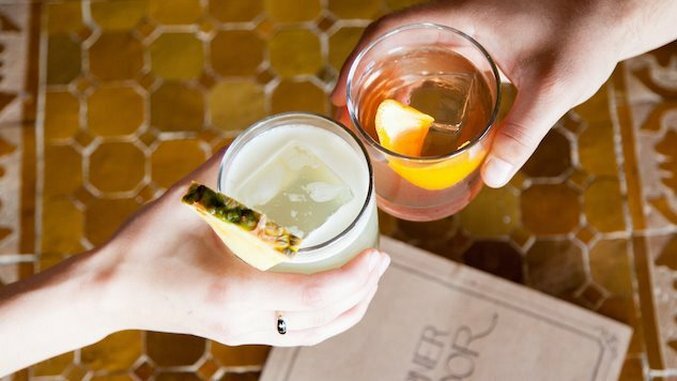 In fact, this Highland Park spot is famous for its colorful, Instagram-worthy takes on Latin American cocktails like Paloma, Pisco Sour, Chipotle Pineapple Mojito and Old Fashioned with Sino Irish Tequila. If it’s mezcal you’re after, then the crowd-pleaser Smokey Margarita, essentially a lime margarita with mezcal as the base, won’t steer you wrong. They’ve also got Mezcal Mule on the menu if the occasion calls for a stronger drink. If all else fails, ask resident mezcal alchemist Sol Luongo to mix you up something fruity and delicious with the best bottle from their mezcal wall of fame. Whatever you decide on, pairing it up with small bites made by a local vendor equates a very good night. According to general manager Dave Purcell, Melrose Umbrella Co “pays homage to the years immediately following prohibition’s repeal. Unlike the trend of re-creating ‘speakeasies,’ which echo secrecy and privacy, Umbrella celebrates the inclusion of the world and the neighborhood in both spirit and effect…” This clearly shows in the Fairfax joint’s old-fashioned décor (antique chandeliers, late-1800s apothecary cabinet, leather bar stools and exquisite tiles), dimmed, low-key vibe and sophisticated pre- and post- Prohibition cocktails. There are many formidable cocktails on the menu, which they’re getting ready to update and add in some new offerings. And they’ve got a few mezcal aces up their sleeves, like their smooth and slightly sweet White Old Fashioned, made with yellow chartreuse, creme de cacao, orange bitters and mezcal. The ACE Hotel’s rooftop bar, Upstairs, is frequented by visiting millenials for its city lights view, al fresco space and outdoor pool area. Despite its tourist appeal, the Downtown LA spot does hold up its own when it comes to delicious quick bites and impeccable cocktails. On any given weekend, this place is packed, and people come for late-night, sit down snacking—the hummus plate and pork quesadillas are on point—or to enjoy the view with a few cocktails. Their signature cocktails menu is ever changing, so it’s a tad hard to pin down a favorite. Currently, there are two mezcal concoctions on hand: Peluca Lake Michelada, which at $5 extra can be made with mezcal, and the 0 to 100. The latter is a yummy entry-level mezcal cocktail in which both mezcal and tequila serve as base, which, along with the name, might cue you in on just how many of glass of the stuff you should consume. The Peluca Lake Michelada might be a bit of an acquired taste as it does contain fish sauce. However, palettes well versed in Mexican (or even Asian) cuisine will find this tomato juice-based, salt-rimmed drink mixed with a Mexican lager, tamarind, lime, Serrano and tajin an excellent and comforting choice. Popular spots in Hollywood that are neither obnoxious nor tacky are few and far between, so smart spots like The Spare Room at the Hollywood Roosevelt are something to be treasured. This sophisticated yet unpretentious bar, one of three onsite at the legendary hotel, exudes a Prohibition era vibe with fun, modern twists. There’s a classic two-lane bowling alley as well as wooden board games on hand, for example. It’s best known, however, for its delicious cocktails, many of which are the brainchildren of mixologist and bar director Yael Vengroff, who believes in curating their ever changing cocktails menu based on their patrons’ tastes and demands. She’s also got a knack for creating highly addictive fruity mezcal cocktails that are tropically sweet but not sickeningly sweet. A popular one was the Noi Noi, which sadly is currently not on the summer menu. There is still, however, the Show Off, a delightful mix of mezcal, mango, apricot, campari, lime and of course, chili salt. A new one to try this summer over a bowling match or a game of Monopoly and a basket of truffle fries is the Big Blind, which is essentially mezcal mixed with punt e mes, benedictine, velvet falernum and caraway salt.